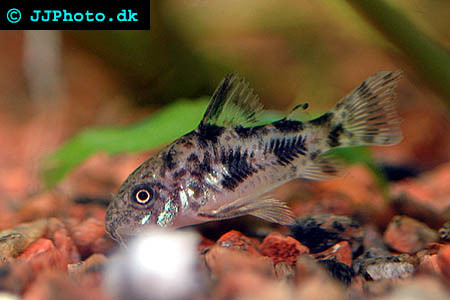 Company: Corydoras paleatus (Peppered Corydoras) can be kept in community aquariums. Aquarium setup: Corydoras paleatus (Peppered Corydoras) should be kept in a well planted aquarium. The aquarium decoration should also contain a lot of roots and rocks placed in such a manner that hiding places are created. Corydoras paleatus (Peppered Corydoras) prefers a well oxygenated aquarium. They should be kept in groups of 6 fishes or more. Feeding: Corydoras paleatus (Peppered Corydoras) will accept all food that sinks to the bottom of the aquarium. 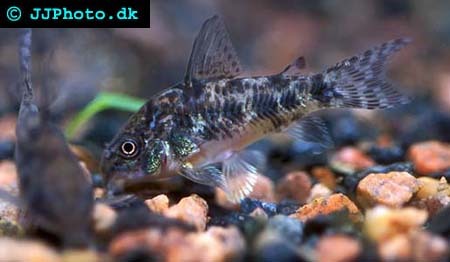 Breeding: Corydoras paleatus (Peppered Corydoras) can be sexed by the fact that males are slimmer then females. Spawning can be triggered by make large water changes and lowering the temperature. Place two males and one female in the breeding aquarium. The female deposit her eggs in different places all around the aquarium.